Wine Education is fun and informative here at Brightwater Vineyards. We practise it every day at our Cellar Door and it is our pleasure to share our knowledge and experience with others as they take baby steps into the wine world. 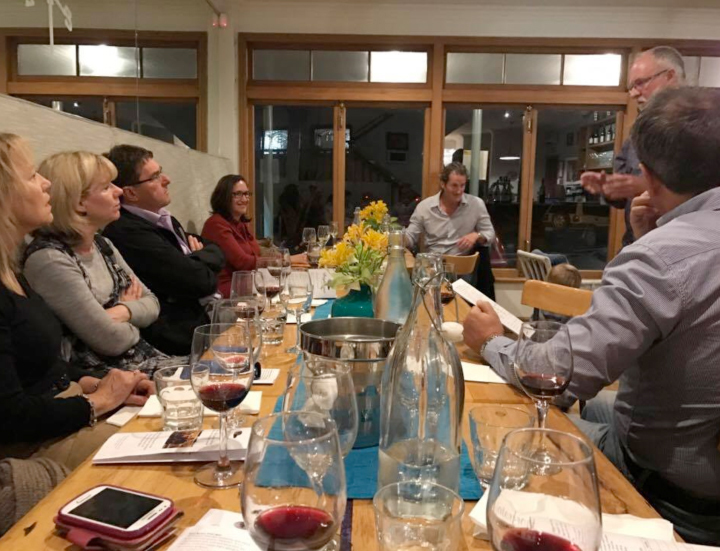 We also really enjoy hosting wine clubs and tastings at different restaurants, building the Brightwater Vineyards brand and sharing our passion for making great wine. Recently we held a wine tasting at the Harbour Lights Bistro in Nelson with Steve and Jessica. We decided to show a series of three different varietals from the Brightwater Vineyards range against their counterpart from our prestigious Lord Rutherford range. Steve prepared a different canape especially designed for each individual wine. The guests were all knowledgeable about wine but very few had ever tried two wines from the same producer from two different ranges side by side. It gave Gary an opportunity to explain the differences in vineyard practises, winemaking techniques and the influence from the age of the vines in a fun and relaxed way! It was a really enjoyable experience and many thanks to Steve and Jessica at Harbour Lights Bistro for having us! Seriously made wines showing clarity, purity and detail, complimented by elegant complexity.